Wisconsin voters had their say in the presidential nomination process on Tuesday. OK, did that. Now it’s on to much bigger stuff: a recall election for the governor. Wisconsin officials announced on Friday that citizens had turned in enough signatures — actually, hundreds of thousands more than necessary — to mandate a recall election of Gov. Scott Walker. If he loses, he would be only the third governor to be recalled in U.S. history, and his fate will tell us much about the political winds of 2012. Walker, a Republican, was elected in November 2010, buoyed by a national Tea Party wave. Republicans swept the state: conservative newcomer Ron Johnson knocked off liberal icon Russ Feingold for the U.S. Senate seat, and the GOP gained control of both chambers of the state legislature. Upon taking office in January 2011, Walker proposed a bill that he said would save Wisconsin hundreds of millions of dollars over two years by requiring state and local government workers to contribute more to their health care plans and pensions, and would remove most collective bargaining rights for unions of public employees. Protests against the bill started within days. The protests gained national attention due to their size, but also because protestors in other states cropped up. 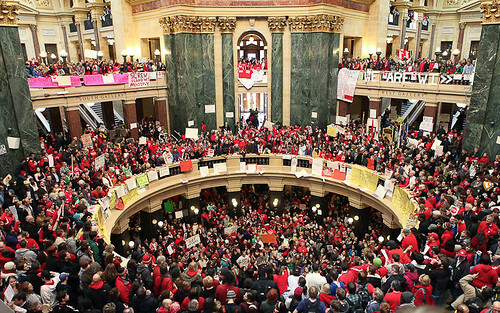 In Pennsylvania, for example, protestors gathered at the state capital to stand in solidarity with Wisconsin protestors and to declare that they would not tolerate a similar bill curtailing collective bargaining. At the time, other states, such as Oklahoma, Tennessee, and Ohio, were considering similar bills. Ohio passed a bill even tougher on collective bargaining, but it was overturned by state voters in autumn 2011. The Wisconsin bill eventually passed, then underwent a number of court appeals and orders, and in May 2011, the Wisconsin Supreme Court reinstated the bill. In the wake of the bill, Democrats in Wisconsin led recall elections to remove six Republican state senators, and unseated two — one less than needed to halt the legislation. In January 2012, Democrats and union leaders started collecting signatures to meet requirements for a recall election of Walker. They eventually turned in more than 900,000 signatures, 80% more than needed. 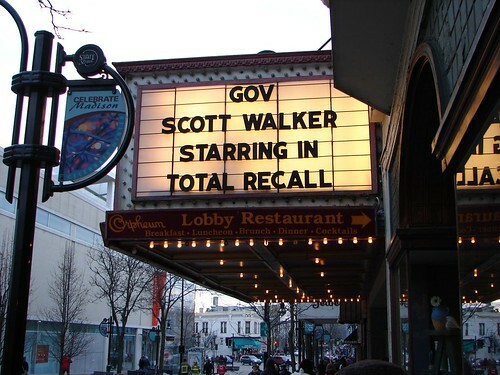 Walker and his team said they are ready for the recall election. Ciara Matthews, a Walker campaign spokesperson, said, ”We have long said that we anticipated the election process would move forward. Now it is time for voters to examine the choice they will be faced with in June. We believe a majority of Wisconsin voters will stand with” Walker. There will be a Democratic primary to select a candidate for the recall election on May 8. Four candidates are in: Tom Barrett, Milwaukee mayor and the Democratic nominee for governor in 2010, former Dane County Executive Kathleen Falk, Wisconsin Secretary of State Douglas La Follette, and Wisconsin State Senator Kathleen Vinehout. The recall election itself will be June 5. Many Wisconsites are ready to vote now. A supporter of Wisconsin governor Scott Walker at a rally on Jan. 7, 2012 (Photo courtesy of Flicker member coachsingleton). An earlier poll conducted by Marquette Law School found that approximately half of Wisconsin citizens say they have a favorable opinion of Walker, while 45% say they see him unfavorably. Additionally, 50% say they also approve of how Walker is handling his job, whereas 47% say they disapprove. Parks is not alone in her focus on the recall election. A NBC/Marist poll in late March of potential Republican voters found that voters were following the recall election more closely than the Republican presidential primary, 51% to 37%. The recall election has national implications. For starters it will attract funds from both Democrats and Republicans from across the nation. The Washington Post reported, “Millions of dollars are pouring into Wisconsin from wealthy conservatives nationwide, and labor unions are preparing to pump resources into the campaign.” One conservative group, Americans for Prosperity, has already spent more than $700,000 on TV ads. Beyond the money, a win by Walker would signal support in a progressive midwestern state for more conservative and limited rights for unions. In contrast, a win by a Democrat could mean the end to the hold on collective bargaining in the state, and build Democratic confidence in bouncing back from a politically disastrous 2010. Forget about waiting for November: the national election season opens in two months in Wisconsin.